Core words are an essential part of any balanced AAC system. What are these core words? Why should we use them? And most importantly, what are some practical tools and strategies that can help us implement a core word approach? While spoken language has at least 250,000 words, a list of only 200 words accounts for about 80% of the words you use every day! These words are called “core words”. Core words are usually verbs (“go”, “come”), adjectives (“good”, “little”), prepositions (“to”, “on”), pronouns (“you”, “that”), articles (“the”, “a”), and conjunctions (“and”, “but”). Only about 10% of the first 200 core words are nouns, and these nouns are very general (“girl”, “house”) rather than specific (“porcupine”, “celery”). If we give AAC learners quick access to these core words, we’re providing them with a powerful and flexible tool to communicate whatever they want to say. Rather than relying on preprogrammed sentences or phrases such as “I want” and “I see”, they can choose from a relatively small set of words to create their own sentences, express ideas, and work on grammar. Rather than only making choices from photos of objects, they can learn to communicate for a wide variety of reasons. Rather than learning new curriculum words for each new lesson, they can build their language skills by using a consistent set of flexible words to answer questions about curriculum topics. Don’t forget fringe words and the alphabet! Core words are essential, it does not mean that we do not provide other important vocabulary. Core words should be within an AAC system alongside “fringe” words. Fringe words are very specific words that have a more narrow meaning than core words. They have a different kind of power - the power to precisely describe something in as few words as possible. Fringe words are usually nouns, but more specific verbs (“leap”, “dice”) and adjectives (“elegant”, “delicious”) are fringe words as well. Each individual fringe word is not used as often as a core word, so AAC systems are usually arranged with the core words on the first, or “home” page, and fringe words are located in other folders. The average English speaker uses about 20,000 words regularly. Since about 200 of these are core words, this means we use about 19,800 fringe words. But all fringe words are not equally important for every person. Everyone has certain subjects that they really love to talk about the favorite people, places, and things in our lives. These words are different for each person, and one of the most important parts of setting up a vocabulary for someone is to make sure these words are available and easily reachable in the fringe folders. In addition, all AAC systems should have access to a keyboard, allowing an AAC user the ability to start scribbling/writing with a keyboard within their AAC as soon as possible. 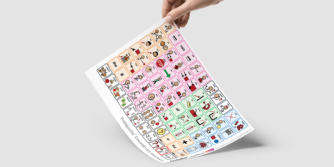 Core words, with easy access to fringe words and a keyboard, make up a balanced AAC system, which can allow for powerful and independent communication for AAC learners. What are the challenges to teaching core words? For many years we have taught AAC users to make choices or name objects, so as an AAC community teaching the “fringe” words seems to come easily. However, how do we teach core words? Core words are more abstract, and less “picturable”; many core words have multiple meanings. Often, when we create a core word display, we have so many little core words on the page, people may seem overwhelmed with all the words. Choosing a place to start teaching core words can be complicated. The answer actually turns out to be simple - we teach core words by using them on the AAC system while we talk. Core words can be taught in the same way as any words on the AAC system. We model core words as often as we can in everyday situations. When modeling, we point to core words on our AAC system as we talk with AAC users. Once we realize the value of modeling to teach core words, we are likely to still have questions. Which words should we model? What kind of word combinations should we model? Here are a few approaches to help you begin to answer these questions. 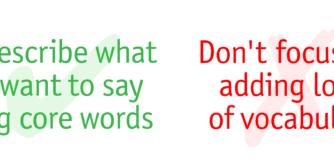 Choosing words based on different communication functions can be an effective place to start. One of the key factors that can limit our students’ communication development is restricting our modeling to requesting and choice making. These are relatively easy to teach, and give a lot of initial “bang for your buck”. However, there is so much more to full communication! What if all we could do was request? How much would we have inside that we couldn’t express? How interested would other people be in talking with us? Instead, let’s look at different communication functions! If we consider all the different reasons we communicate, we will find many core words that will help an AAC user build language for communication. Here are a few basic examples of using core words within some different communication functions. Asking for information what? what that? where? where go? who? who go? what are we doing? where is Dad? who is going to the party? Now, think about how you can put this into practice. What are the current communication functions the AAC user is using? Which different communication functions can you teach? Which core words would help achieve these? It can also be useful to select core words that are used to communicate during a specific, frequently occurring activity. We do not need to develop an activity-specific board for this. Instead, let’s see if we can use our core words on the AAC system, with some use of fringe folders for more specialized vocabulary. Music turn on, off, turn up, down what like? what next? want more, want different, do it again like, not like, good, bad turn on iPad for music, turn on CD player, I want Keith Urban, I want to listen to more, No more GangStyle, What music do you like? Now, think about how you can put this into practice. Think of an activity you do often. What core words could you add to your modeling? What core and fringe words could you combine for longer sentences? For many ideas on how to integrate core words into common activities, go to the AssistiveWare Core Word Classroom. In particular, check out the Core Word Planners and Core Word 5 Minute Fillers. Another way to structure the process of teaching and modeling core words is to schedule a set of words to focus on each week or month. This makes modeling more manageable. As long as we keep adding new words while continuing to model words from previous weeks, we will end up teaching a full vocabulary with many core words. The approach works because invariably, the team will find that any core word can be used many times throughout the day. In addition, each core word can be easily combined with other words to make many useful messages. Core Word of the Week has recently become quite a popular approach. We can find many useful resources in this area. To help you plan how to use this approach, here are a few things to consider: What core words might the AAC user already know? What additional core words would be functional and useful words to teach? Can your environment consider adopting the Core Word of the Week approach? For many ideas on how to use the Core Word of the Week approach, check out the AssistiveWare Core Word Classroom. The Core Word of the Week Planners and Displays are designed to support this approach. The Descriptive Teaching Model, developed by Gail van Tatenhove, is a useful technique in many educational environments. This is a way of using core vocabulary to describe academic concepts, rather than programming a large number of specific fringe vocabulary words. In this teaching approach, instead of asking AAC users to memorize specific nouns to answer academic questions, the AAC user can combine core words to describe the concepts in the lesson. For example, in a lesson about the life cycle of the butterfly, the teacher may ask the student about the chrysalis stage. The teacher could ask a closed question with one right answer, such as “What is the name of the third stage of a butterfly’s life?” To answer this question, the student has to have “chrysalis” programmed into his system, or at least have a low-tech choice board with the stages represented. Using the Descriptive Teaching Model, the teacher could instead ask “What happens during the chrysalis stage?” The student could answer using core words: “It sleeps inside.” “It changes to a new thing.” “It turns pretty.” Each of these sentences shows that the student understands this stage of the life cycle. It gives the AAC user more practice retrieving core words and combining them into meaningful sentences. Because modeling is also required, it requires the teacher to think about how to translate concepts into core words. This encourages teaching concepts at a deeper level. It requires the AAC user to think more deeply and creatively about a concept in order to describe it their own words. It saves time spent programming and learning how to retrieve infrequently used words. All of these strategies encourage teaching core words in natural contexts. Through repeated modeling of the words to communicate during real, fun activities, AAC users learn the meaning of non-picturable words and how to use them to communicate. In the end, we all have the same goal for the AAC users – to give them the ability to communicate their thoughts clearly to anyone they need to talk to. Core words can do this! This article on core word strategies is just one in the Learn AAC series about “Building Language and Communication".